After a succession of sell out runs at Ustinov Studio Bath, St James Theatre and the Arts Theatre, Joshua Harmon’s critically acclaimed comedy Bad Jews returns to the West End. 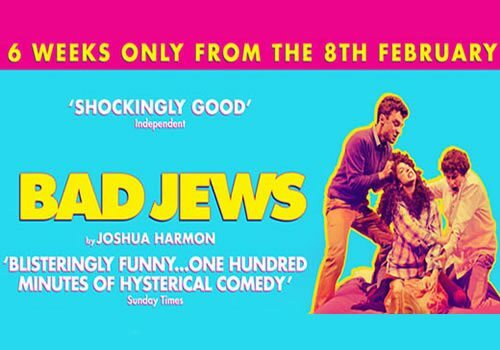 For a limited six week season, Bad Jews will play at the Theatre Royal Haymarket. Directed by Michael Longhurst (Constellations), Bad Jews follows the story of three Jewish family members and one non-Jewish girlfriend who gather in a poky Manhattan apartment after the death of a family member. A riotously hilarious argument ensues over the prized family heirloom that was left behind. Ilan Goodman (The Imitation Game, Intimate Apparel) is set to reprise his role as Liam, the wealthy cousin and his non-Jewish girlfriend Melody will be played by Antonia Kinlay (The Three Lions). Additional cast members include Ailsa Joy (TimePlays) as devotedly religious Daphna and Jos Slovick (Once) as Jonah. Harmon’s previous writing includes Significant Other, A Boy Named Alice and Terese Raquin. Bad Jews is co-produced by Theatre Royal Bath Productions, Kenny Wax and Theatre Royal Haymarket Productions. Bad Jews is following the hugely successful transfer of Hampstead Theatre’s Mr Foote’s Other Leg and is set to open February 8th, playing at the Theatre Royal Haymarket until March 19th. Not suitable for young children as contains themes of mild violence.